WPH Outdoor had an amazing year of handball in and out of the cup series. From January to September of 2016 the WPH Outdoor crew administered a Cup series that culminated with the huge 3WallBall Outdoor Worlds in Las Vegas. After the Vegas event concluded, players made preparations for the US Open of Handball in Fountain Valley, CA. Even though the WPH was done with the Cup Season, the ranking points continued for 1 & 3 Wall Big Ball @ the open and the players responded with some of the most exciting play we’ve seen all season. Besides entering #BEASTMODE, Samzon Hernandez also re-entered the top 10; as did Long Beach stand-out Manny Suarez. 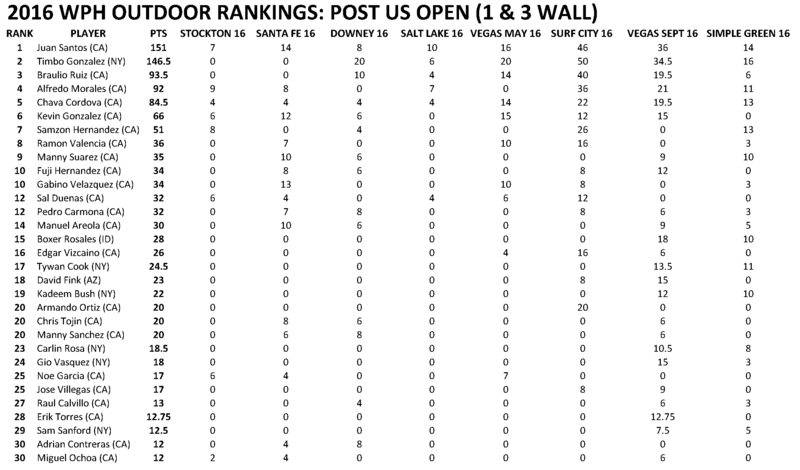 Timothy Gonzalez slammed the US Open but fell a couple points short of topping Juan Santos for the overall lead; meanwhile, Shorty Ruiz (#3), Alfredo Morales (#4) and Chava Cordova (#5) round out the top five. 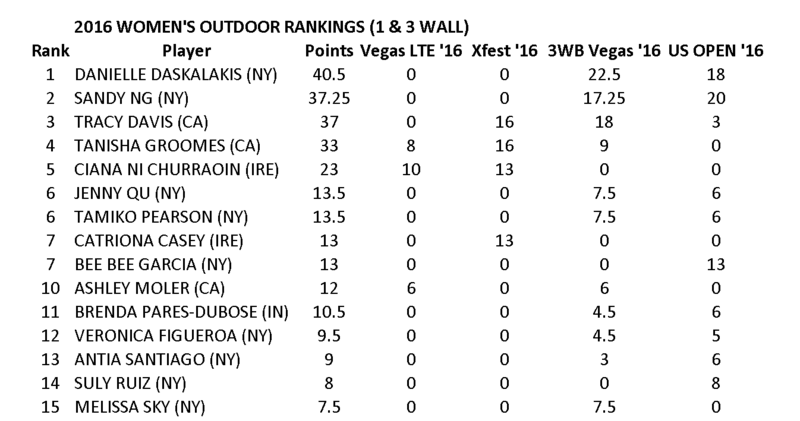 In the women’s rankings, Tanisha Groomes drops from the #1 spot, post Vegas, to #4 and is surpassed by Danielle Daskalakis (#1), Sandy Ng (#2) and Tracy Davis (#3). Groomes was the Cup Champion, but a season ending knee injury kept her away from valuable US Open Points (where respectable finishes would have kept her atop the charts).